"Disturbia III - Pas de Deux"
I seem to move from one obsession to another – at the moment, I’m fascinated by triangles – and this is the latest (publishable) result. Take plank of wood – in this case ash. Chop each of those along the diagonal to make 2 triangles. Well, for me, that all proved quite challenging – there’s a “how square is square” forum thread going on elsewhere – what I learned is that only square is actually square – the slightest fraction of non-square and things just don’t join together properly. I realised from the very inception of this design that there are some potentially serious wood movement issues here, and I resisted making it for a long time. But, in the end, I figured I’d give it a go – the worst that can happen is that it falls apart. It’s not very big, which helps. And everything is joined together with some serious splines – full-length, double, 6mm beech splines that were a snug fit. The hat wouldn’t put them together, and only one needed a bit of mallet tapping. Top is 23cm, or 36cm, or 41cm, depending where you measure, 26cm high. Finish with Linseed oil followed by Danish oil. I like the continuation of the grain down the legs. Very interesting. Nice job on the design and build. 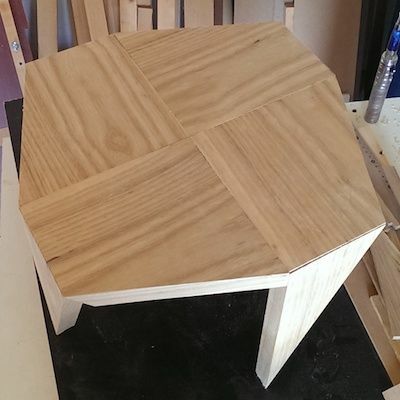 Very nice table and I really like the design….great job. Looking down on the top I wonder what thoughts you had about grain pattern in relation to each other. The ash has an interesting thing going on with the wide grain and then the tight grain. I almost thought it was oak but then I am not very good with distinguishing wood types. The angling of the legs to a point give it some motion from a side view that I think provides interest from a normal static table design. Well done, sir. The rottenstone grain highlighting makes all the difference, and was one of the main reasons I chose ash. I used the same technique a while ago on this project. a very interesting build..and visually interesting too. Definitely an eye catching project! It IS quite small though – do you have plans for using it or was it primarily a design inspiration? It’s for use, to be sure – a small side table, methinks. I can see why you might be concerned about movement, but if you used sliding dovetails and only glued toward the center? Butterfly splines? Actually, I don’t know what I’m talking about, but I read those buzz words somewhere. I really like the table, seems like it would be worthwhile to do it up big and all. I tried to do some waterfall pieces, but couldn’t figure out how to hide the lag bolts.